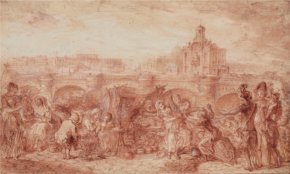 6/4/13 - Art market - Paris - Next 10th April two beautiful auctions will be taking place in Paris, one at Artcurial with an equal number of drawings and paintings as well as sculptures, the other one at Christie’s devoted solely to old master and 19th century drawings. The Artcurial offering is certainly one of the most exceptional for old masters organized in the recent past by this auction house. It also provides an accompanying catalogue, a thick volume in which readers will find many lots described in true entries. Among the drawings, we would point out an anonymous Study of Boats, probably by a Roman artist of the first half of the 17th century (ill. 1), presented as coming from the circle of Claude Lorrain ; a sheet by Guillaume-François Colson preparatory for a painting presented at the Salon of 1812 residing in Versailles today, which depicts General Bonaparte Entering Alexandria on 3 July 1798 (ill. 2) and a Young Woman Braiding her Hair in front of a Mirror by Edgar Degas, probably produced in Italy. There are other drawings which might interest art enthusiasts, such as a very beautiful watercolor representing a View of the Erechteion in Athens by Louis-Philippe Boitte, Prix de Rome in architecture, (estimated very reasonably, no doubt to the artist’s lack of reknown, at 2000 to 3000€), but the high points of the auction will be found in the sculpture pieces (despite the restricted number) and, above all, the paintings. For the sculpture, there is a very surprising object, a sort of installation which includes 101 tiny terracottas by Jacques-Edme Dumont (ill. 3 and 4), the son of the sculptor Edme Dumont, a student of Pajou and winner of the Prix de Rome in 1788. 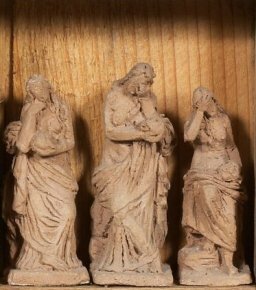 Though he had an official career as monumental sculptor, he also specialized in the extremely refined execution of very small terracotta figures, apparently more as an exercice for his own interest with no intention of producing them later on a large scale or selling them either. In 1989, many of them came up for auction at the Hôtel Drouot and the Amis du Louvre had purchased four for the museum. The ensemble to be sold at Artcurial, which comes directly from the artist’s descendants, stands out for the peculiar fact that it is set in a printer’s case, a layout no doubt chosen by one of the heirs (some of which were in the printing trade). In any case, we hope the ensemble will not be sold separately and scattered ; in fact, a French museum could very well be tempted to pre-empt it. Still on the subject of sculptures, we would also note a beautiful terracotta Roman Charity of the late 18th century and a plaster cast by Gustave Doré (ill. 5) preparatory for the bronze d’Artagnan in the monument to Alexandre Dumas at the Place du Général Catroux in Paris. Estimated at 10 to 15,000€, this work should interest various French museums, from the Carnavalet (despite the fact, alas, that the museum’s acquisitions policy seems far less ambitious in the last few years) to the Musée d’Orsay, and why not, in the provinces, the Musée Brou in Bourg-en-Bresse which recently purchased a beautiful painting by the artist. Finally, Artcurial is also presenting a significant number of remarkable paintings, including a landscape by Jacob van Ruisdael (Waterfall in a Landscape with Two Fishermen (ill. 6), a canvas by Jean-Baptiste-Marie Pierre (ill. 7), several 17th and 18th century Italian paintings (Francanzano, Giulio Carpioni...) and 19th century French landscapes with an impressive view of the fire at the Tuileries during the Commune, by the little-known Léon-Auguste Mellé which should, here again perhaps only ideally, interest the Musée Carnavalet. We could quote many other works but will conclude with an enigma : a portrait (ill. 8) of Jacques-Edme Dumont (with the same provenance of course as the terracottas) by an unidentified painter who is probably one of the finer exponents of this genre. Christie’s, as we said earlier, is offering a beautiful auction specialized in old master drawings (also with a fine catalogue). It includes an important sketch by Nicolas Poussin perhaps in preparation for The Will of Eudamidas in Stockholm (ill. 9), several very beautiful 18th century French sanguines with, for example, The Quai de Mégisserie and the Pont Neuf by Gabriel de Saint Aubin (ill. 10) and Monumental Fountain at the Entrance to a Park by Jean-Honoré Fragonard, a portrait of a woman by Ingres and a Head of a Lion by Théodore Géricault. However, we would like to dwell on four very important albums containing a total of 247 drawings by Luc-Olivier Merson (ill. 11 and 12), preparatory for Trophées by José Maria de Heredia. They present many studies for the same compositions at different stages of the production, from a roughly sketched study to the final achievement, with the artist’s very beautiful technique. We are highly pleased that the auction house has resisted the temptation of selling the sheets separately as they form a single art object with their beautiful Art Nouveau bindings and also for wishing to sell all four albums together in a single lot. Here again, we can only hope that a museum will save the ensemble from being dispersed, otherwise a true loss for art history. Artcurial, 7 Rond Point des Champs-Elysées, 75008 Paris. Auction on 10 April 2013 at 6 pm. Public exhibition : Monday 8 April and Tuesday 9 April from 11 am to 7 pm. Online catalogue. Christies, 9 avenue Matignon, 75008 Paris. Auction on 10 April at 3:30 pm. Public exhibition : Monday 8 April and Tuesday 9 April from 10 am to 6 pm, Wednesday 10 April from 10 am to 2 pm. Online catalogue.